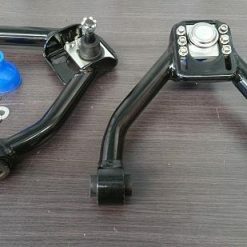 Steel adjustable rear lower arms for Toyota Toyota MK2 & JZX90/100. These allow you to alter rear track for grip, width and roll adjustment. 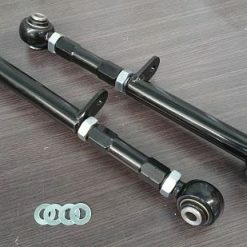 Using high quality rose joints they eliminate the stock, soft rubber bushes and come with 12 month bearing warranty and lifetime warranty against arm failure. Do not confuse these with cheap, generic arms – they’re the same as used on championship winning drift/track cars around the world.